St. Salvator Church (Kostel sv. Salvátora) is one of two churches that form the Klementinum, the largest and most historic complex of buildings in the Old Town in Prague. St. Salvator is a city landmark, a large majestic church set at one end of Charles Bridge, proudly marking the entrance to the Old Town. The Jesuits built St. Salvator Church in the Gothic style between 1578-1601, although important Baroque features were added between 1649-1654. Famous architects Lurago, Caratti and Kanka were all involved in its construction. 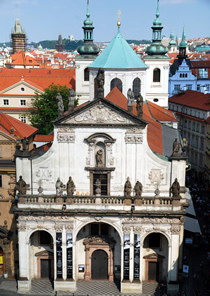 Today, the church is considered one of the most valuable examples of early-Baroque architecture in Prague. It has a beautiful Baroque facia, with porticos decorated with sand-stone sculptures of saints by Jan Jirí Bendl. A niche in the wall houses a sculpture of the Virgin Mary. Inside St. Salvator Church there are three very high aisles, with galleries, and a dome painted with frescos. And St. Salvator conceals a paradox which characterises the work of the Jesuit Order in Bohemia: in the crypt are buried not only Father Koniáš, the “destroyer of Czech books”, but also Bohuslav Balbín, the “defender of the Czech language”. St. Salvator has not one, but two magnificent organs. These have been recently restored and both are played at Mass and during classical music concerts, which run throughout the year. During the winter the seats are heated and have cushions, but it is advisable to wear warm clothing for the concerts. For listings and to book tickets for classical concerts at St. Salvator Church Charles Bridge: Prague concerts.